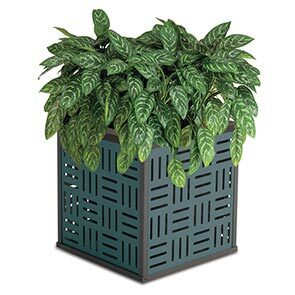 Add some curbside appeal or spice up the interior décor by creating an impressive atmosphere with the Element Series Planters. Three distinctively fashionable panel styles, each made with 14-gauge steel powder-coated in a choice of modern color options. Engineered to maintain upscale aesthetics, requiring only minimal maintenance the steel panels and aluminum frame are finished with a state-of-the-art powder-coating—proven to prevent rust and stand up to all-weather conditions. The planter base comes standard with adjustable leg leveler feet for stability and is designed to be portable or surface mounted with optional hold down kit.